of Chief Judicial Magistrate, Karbi Anglong, Diphu. Educational Qualification: Read up to Class VIII Standard. Educational Qualification/ Experience: Read up to Class VIII Standard and experience in driving for at least five years in any govt. department/ govt. undertaking/ organization. The applicants must submit their applications in the Standard Form along with self attested photocopies of educational certificates, mark sheets etc, and three (3) copies of recent passport size photographs. The selection will be carried out in 2 phases. There will be a written test of 30 marks and that will be followed by a viva voce of 20 marks. For selection of driver a driving test shall be conducted for 10 marks. Those 10 marks shall be allotted out of the 20 marks reserved for viva voce test. Completed applications along with all testimonials as mentioned above should be addressed to “ The Chief Judicial Magistrate, Karbi Anglong, Diphu, PIN-782460, Assam” and should be dropped in the drop box, leveled as “Drop Box for Applications, Peon” and “Drop Box for Applications, Driver” to be kept at the office of the Chief Judicial Magistrate Karbi Anglong, Diphu within stipulated date and time. Last date for receipt of applications in the drip box is 20.10.2017 up to 5 pm. Drop box will be closed thereafter. Applications submitted in any other mode, except as indicated and incomplete applications will be summarily rejected without any communication to the candidate. Candidates who are already in government service must submit “no objection certificate” from the appropriate authority at the time of interview. 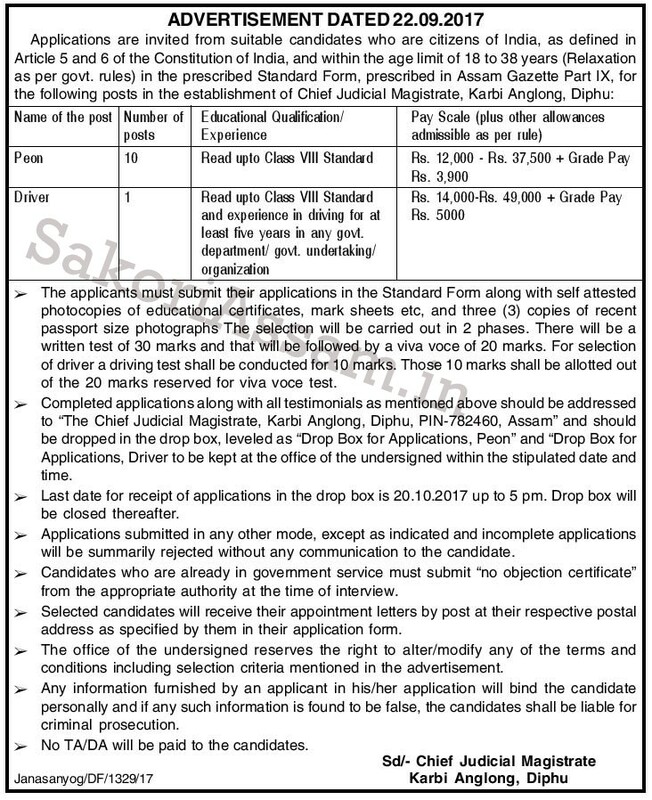 The office of the Chief Judicial Magistrate, Karbi Anglong, Diphu reserves the right to alter/modify any of the terms and conditions including selection criteria mentioned in the advertisement. Any information furnished by an applicant in this/her application will bind the candidate personally and if any such information is founded to be false, the candidates shall be liable for criminal prosecution. Last Date: 20.10.2017 up to 5 pm.